For more information go to www.MJAUTOWERKS.com *NEVADA TRUCK* The Drive train shows to be all original and features the 5.7 350ci motor along with the 4 Speed Manual transmission and 3.73 Rear end. It is all factory equipped with no aftermarket or performance parts. The service department has done a standard service along with a inspection to just verify it is road worthy. I have drove this truck myself and was pleasantly surprised on how it ran and rode. I have put about 50 miles or so on it including 65+mph and like I said it rides really nice. The clutch is good along with the transmission having no grinding and the motor is very quiet and runs well. The exhaust does not have any leaks and sounds stock. The underside is clean and dry but it does have some old grease build up. The power brakes and steering work as they should. The exterior is pretty rough with multiple dents. We can not say this one is all rust free because it is not. The frame is all solid with no rust. The worst of it all are the front floor boards meaning they will need replaced and the front inner wheel wells have rust around mounting bolt. The passenger door bottom and rocker seam along with both cab corners have some filler and it looks like its from previous damage, not rust. I can not say for sure what is underneath. The rest of the truck including the core support, bed, fenders, etc... is very solid with nothing that stood out. The rear wood is obviously rotted, but all the braces are there and solid. The tail gate is missing along with the RH mirror and RF marker lights and we do not have any of it. The interior is all there but pretty rough. The tan cloth bench seat is torn up underneath the cover along with the dash pad. The steering column is from an automatic and has some issues including the turn signal switch is broke and the ignition key stays in crank position so once it starts you have to manually turn it back and we do not have a door key. The original column is in the tool box. The emergency brake pad is missing along with the dome light, and wiper switch knob. All of the gauges are in working order with exception to the temp gauge. Both fuel tanks and gauge work along with all wipers, dash lights, door glass, and factory radio/stereo. The overall truck is all there and its a great starter project or keep it as is for a driver with some minor TLC. We do not know the miles with it being a 5 digit OD. The original build sheet was found under the seat so there is a picture of what is left of it. 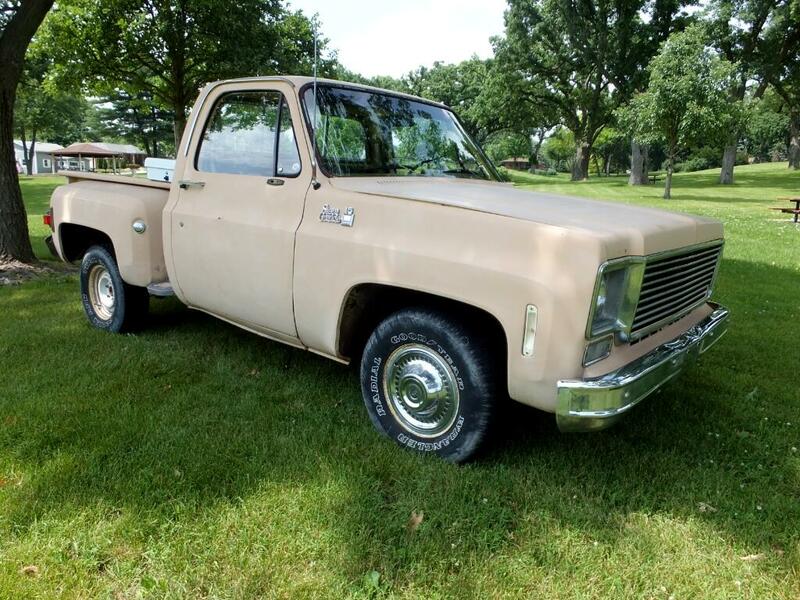 Message: Thought you might be interested in this 1977 GMC C10.